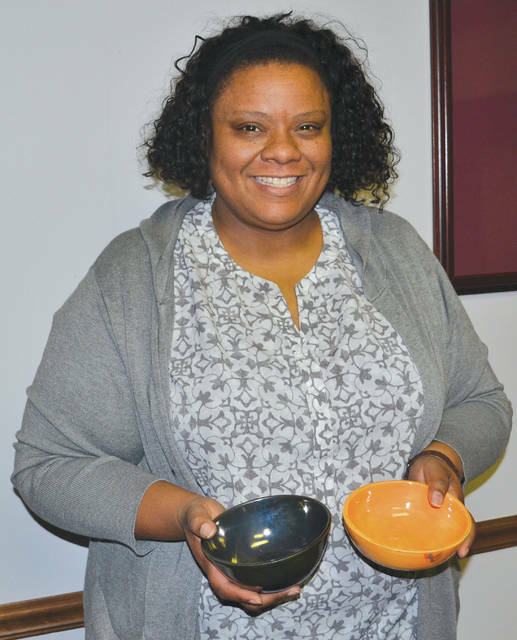 Tyra Jackson, executive director of Second Harvest Food Bank, holds two of the ceramic bowls that may be used to serve soup at the Feb. 28 Empty Bowls fundraiser. 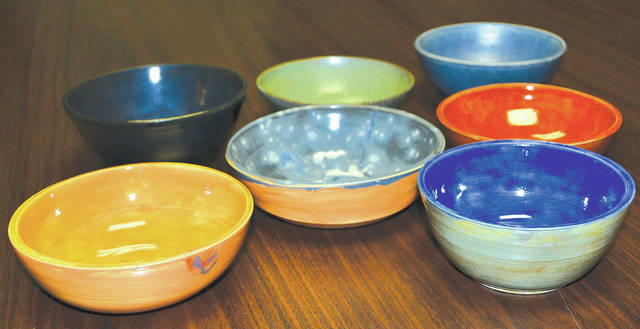 Ceramic bowls will be used to serve soup at the Feb. 28 Empty Bowls fundraiser. Empty Bowls of Champaign County will serve its 8th annual dinner at the Urbana University Student Center on Feb. 28 from 5 to 7 p.m. The event is a fundraiser for Second Harvest Food Bank of Champaign, Clark and Logan counties and offers each patron a hand-crafted ceramic bowl and a simple meal of soup and bread for $15 per bowl. Second Harvest Food Bank collects, stores and distributes over 500,000 pounds of food annually to 68 member agencies, including nine food pantries, soup kitchens and shelters in Champaign County. This year is the 25th anniversary of the Clark County Empty Bowls fundraiser, which will take place at Wittenberg University on March 14. A Logan County Empty Bowls fundraiser will take place May 2. According to Jackson, Second Harvest relies heavily on Empty Bowls fundraisers to bring additional funds into the community. Every dollar that the organization raises in this way is able to provide five meals for the food-insecure. Springfield High School will make about 200 bowls, Graham High School will make about 50, and others are donated by local potters. Local restaurants provide the soup and bread, which this year will include Aladdin, Farmer’s Daughter, Airport Cafe, Urbana University, Cafe Paradiso, Carmazzi’s, Coppertop, Depot Coffeehouse, The Hippie and the Farmer, Loveless Farms, Spotted Cow, and Mumford’s Deli. Jackson’s goal is to have 15 soups available at the event. Over 300 people attended last year’s event, and Jackson said attendance grows every year. However, they will have over 500 bowls available, and unused bowls are retained at Second Harvest for next year’s fundraiser. Second Harvest Food Bank is also in the process of becoming a 501c3 non-profit organization. Catholic Charities, their current parent organization, signed over their building to them in October 2018, and Jackson said her goal is to have the process finished by January 2020. To help with that effort, they are looking to recruit an additional 1,000 donors to contribute $25 a month for a year. That fundraising drive will launch in the near future. For more information, contact Second Harvest Food Bank at 937-325-8715.